Those dogmatic types who still view tweaking the LP12 as heresy will miss out on hearing just how dramatically the amazing Funk Vector kit can enhance one's enjoyment of music. 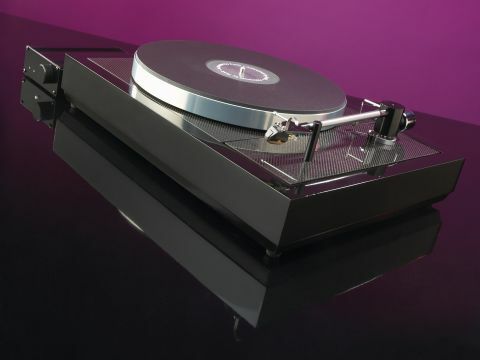 This kit meets its objectives by making the LP12's performance much more LP12-like. It's very much a 'music first' presentation whose clarity will also satisfy the hi-fi enthusiast. It's not an 'official' Linn factory-supported modification, if that sort of thing concerns you. The Funk Vector Link kit is a truly radical modification to the venerable Linn Sondek LP12 turntable. A fully 'Funked-up' LP12 must undergo major surgery before acquiring its racy, carbon fibre-topped exterior. This includes the fitting of a combined subchassis and armboard made of carbon fibre and balsa wood, called the Charm. This can be ordered to suit the tonearm of your choice and can be fitted on its own if you're not going the whole way with the Funk modifications. Opt for the full package, though, and you'll also receive a carbon fibre top-plate, an Achromat to replace the Linn's felt mat and the intriguing K-Drive motor system (including vectoring pulleys). The K-Drive kit employs a DC motor, optimised for mounting on the deck's subchassis, from where it drives the sub-platter through a belt supported by three pulleys. Its power comes from a small external box, housing a Class A, single-ended, low-distortion output stage, with circuits that provide frictional compensation, reduced mains interference and current-derived servo operation. This delivers a smoother and more stable performance from the drive system, which, in turn, enhances the music. Testing with a selection of piano recordings shows that the platter does indeed rotate at the correct speed and with formidable stability. Notes have rock-solid, secure pitch and a delightfully exposed envelope shape that imparts a convincing sense of realism. Left-hand passages also reveal a total absence of the upper-midbass coloration for which the Linn was once criticised by its detractors. An acknowledged strength of the LP12 is its ability to 'follow the tune', and the Vector not only preserves but also enhances this. It displays an amazing aptitude for tracking the melodic and harmonic development of music, no matter how subtle that may be. It's particularly adroit at following delicate harmonies and making abundantly obvious the relationships between different instrumental lines. Aiding it in this respect, is the LP12's inherent dexterity with timing and rhythmic information, which the overt 'clarity' of the Vector seems to amplify. The modified turntable's lack of clutter and background 'noise' lays bare every note, rendering the music with close to the lucidity of a master tape. The same qualities also enable the deck to provide genuinely realistic dynamic contrasts; this is especially noticeable when the music drops rapidly to silence - the abrupt absence of sound is little short of startling. The beauty of the Vector is that it manages this type of high resolution performance without ever sounding sterile or clinical. Its portrayal is always musically coherent and engaging. And therein lies the appeal of this modification: it truly seems to make the LP12 more LP12-like, bringing its positive qualities fully to the fore, while suppressing those that its detractors chose to focus upon.